Proper lighting is a pre-requisite in all types of industries in order to ensure smooth operation, regardless of the level of automation being employed within various processes. 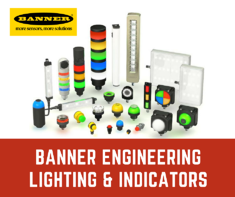 Banner Engineering’s offers a highly impressive range of LED light fixtures, tower lights, indicators & actuators that can enlighten workspaces with superior-quality illumination, unmistakable status indication and maintenance-free operation. Gone is the time when fluorescent & incandescent bulbs used to dominate the illumination market. This is the age of silicon-based devices. Banner Engineering provides world-class energy efficient LED lights capable of providing bright illumination for up to 50,000 hours. These lights are ideal for applications such as enclosure lighting, visual inspection and work cells. WLB32 Series - Banner’s WLB32 series LED fixtures feature a glare-free even light output design that makes it perfect for ensuring top-notch illumination in the workplace. The product is highly efficient and bound to bring cost savings. The metal housing is shatterproof, while installation is facilitated by magnetic or angle brackets, depending on the requirements. WLS27 Shatterproof LED Light for Harsh Environments - These heavy-duty LED lights are known for their rugged design, and are available in IP66, IP667 and IP69 construction. Made of chemical resistant copolyester housing, the shape is ideal for laminar airflow applications. In addition to being highly rugged, these lights are feature-full as well, providing dimming capabilities to the user. The highly resourceful Tower Lights are preassembled & preconfigured multi-segment LED indicators that can offer a convenient solution for complex control problems. TL70 Series - Big & bright, the TL series tower lights feature two banks of LEDs. The entire enclosure is water-resistant (IP65) and can withstand industry-grade harshness. The color segments are available in one, two and three color models. In addition, audible segments are also available to provide greater flexibility during monitoring options in the form of tone selectable 92dB and 101dB modules. CL50 Series - These are large self-contained indicators that house long-lasting LEDs, offering a fool-proof yet easy-to-install illumination solution. On average, the LEDs last for 100,000 hours, while consuming low power and being immune to any nearby EMI and RFI interference. Ideal for lean manufacturing environments, Banner’s ergonomically designed sealed operator touch buttons are the perfect replacement for conventional buttons. 50mm Illuminated Touch Buttons - Formed with the synergy of large, bright indicators and solid-state, touch-activated switching capability, K50 touch buttons have been ergonomically designed to provide the operator with best-in-class experience & ease of use. The buttons are ideal for pick-to-light and call button applications and have excellent immunity to false triggering from foreign materials. Emergencies don’t occur with warnings. Having illuminated emergency stop buttons can greatly assist in limiting the effects of any disaster or incorrect operation. 30mm Mount Emergency Stop Buttons - These stop buttons are easy to install and can start working without requiring too many formalities or intermediate wirings. The latching design is compliant with ISO 13850 regulations. If required, multiple buttons can also be wired in series, for more intensive tasks. The buttons are available in two colors, yellow and red. A rugged, IP65 certified build allows them to function in harsh conditions, while their Safe Break Action ensures that the Normally Closed condition will stay true even if the actuator is separated from the contact block. These various illumination products ensure that clarity is maintained in the workplace, and operators are able to carry out various tasks without confusion in a dynamic, busy environment.